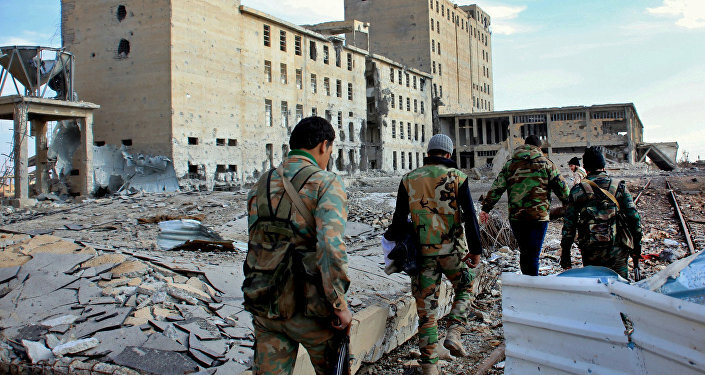 The Syrian Army alongside the National Defense Forces (NDF) attacked Daesh militants’ defense lines in the eastern part of Aleppo province and regained control over a strategic road. Syrian forces and their allies finally restored security in the entire surroundings of Najjarah village. They launched an attack on Daesh positions and took control over the Najjarah-Aisheh axis, a military source told FARS News. Government forces seized Daesh’s weapons and ammunition in the Najjarah region as well as destroyed the militants’ network of tunnels used in their combat strategy. On Thursday, the army foiled a Daesh attack on the highly strategic Kweiris airbase in the eastern part of Allepo. The Daesh offensive started on Wednesday. The militants used suicide car bombs to retake al-Najjarah village, north of the Kweiris airbase. The Syrian Army reacted immediately and destroyed the car bombs before they reached the village. Then, the militants were forced to withdraw from the area, after having sustained heavy damages. Najjarah village was cleared of terrorists by the Syrian Army and popular forces earlier this week.